Kevin Erdmann, of blog Idiosyncratic Whisk, has written extensively and persuasively about housing costs and inflation, but lately topped himself when addressing wages. Erdman in his Sept. 9 post, Real Wage Rates and Tight Labor Markets, takes a look at “quit rates,” and concludes quitters, probably better referred to as “job hoppers,” get higher wages. The quitters move into jobs in which they are more valuable to the employer. So wages in general can rise, but productivity rises too. “This is why the relationship between real wage growth and inflation is not strong,” says Erdmann. Yeah, you know, snuffing out an economic recovery to fight minor wage growth is a bad trade-off. Erdmann notes that present-day wage hikes are below 1990s levels even yet, btw. I note that Q2 saw unit labor cost deflation, as measured by the Bureau of Labor Statistics. The Fed, as widely observed, seems to be in a heightened, frantic, even hysterical state of prissiness regarding the possibility that inflation might migrate back up towards its 2% target (which evidently even Fed Chief Janet Yellen forgets is an average target, not a ceiling). Even worse, the empirical evidence that 2% is a good IT is seriously wanting. As I have oft-noted, from 1982 to 2007 in the United States, the average inflation rate in the United States (CPI) was just under 3%, and real growth just north of 3%. Q: Given the historical record, and the observations of Kevin Erdmann, what makes a 2% IT attractive to central bankers? A: They can undershoot it and be close to zero, their real goal. 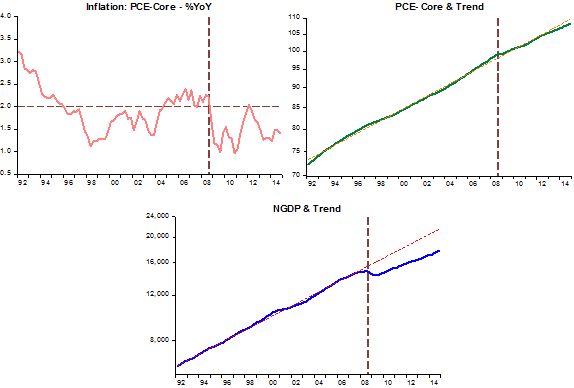 What if a 3% average inflation is a better central bank IT (let alone NGDPLT)? Could the Fed ever alter its IT? Could the Fed go to an IT-band, such as that of the Reserve Bank of Australia? Have American policy-makers and central bankers become so inflexible, so hidebound, so PC, that a moderate increase in the IT is not possible? And if a moderate increase in the IT is not possible with independent central bankers, is independence a good idea? Robert Hetzel, of the Richmond Fed writes “Nominal GDP: Target or Benchmark?” I highlight two passages. 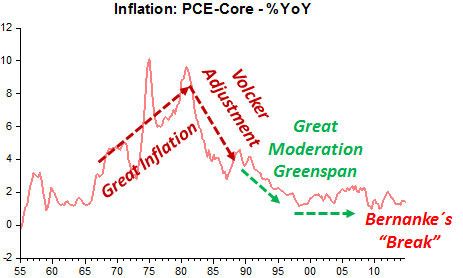 Previous work by the author in 2008 and 2012 argues that former Fed chairmen Paul Volcker and Alan Greenspan followed a nonactivist rule during the period known as the Great Moderation, the years following the Volcker disinflation through the Greenspan era. Although the FOMC does not explain the rationale for its policy actions within the framework of a rule, since this era, policymakers have recognized the need to behave in a consistent, committed way to shape the expectations of financial markets. The chart provides the view of NGDP growth and inflation for the last 60 years. 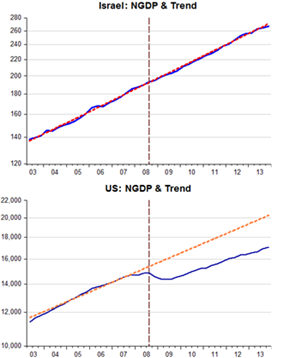 Initially NGDP growth is highly volatile (but trendless). From the mid-60s to 1980, NGDP growth trends up, and so does inflation. 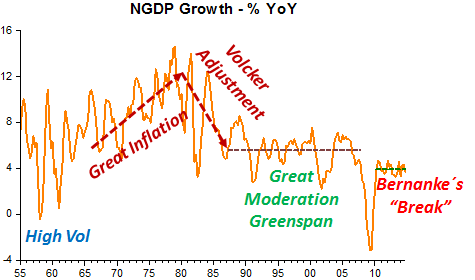 The Volcker adjustment was a period when NGDP growth was strongly reduced with inflation being brought down significantly. Note that from the start of Greenspan´s Great Moderation, NGDP growth is stable, but inflation continues to come down, only reaching the (implicit) 2% target in the mid-90s. As Hetzel notes, the Fed, particularly Greenspan, never explained the rationale for its policy actions within the framework of a rule. As such, the Taylor-rule was an attempt by John Taylor to describe (guess, make-up) a “rule” that was consistent with what the Fed was doing. With time, given the highly successful monetary management of that period, Taylor and his followers want us to believe that the “rule” was responsible to the period´s success! From the chart, it appears much more likely that the “success” (defined by inflation falling and remaining low and stable) was mainly due to NGDP growth remaining stable. 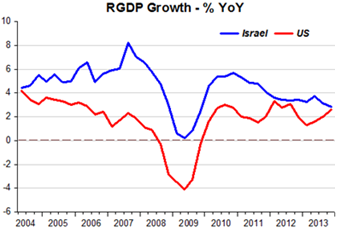 The chart on RGDP growth tends to corroborate that view. Throughout the 1954-2007 period, RGDP growth averaged 3.4% (we´ll see below that is true since 1870!). 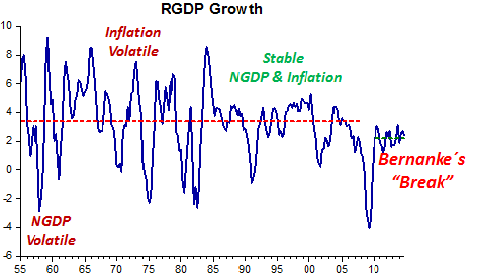 Before the mid-60s, the volatility of RGDP growth is due to the volatility of NGDP growth. During the “Great Inflation”, RGDP growth volatility derives from the inflation volatility of the period (caused by the rising and “chopped” growth in NGDP). 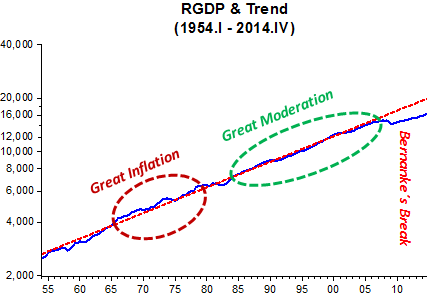 During the “Great Moderation”, low NGDP growth volatility translates into low inflation and real growth volatility! 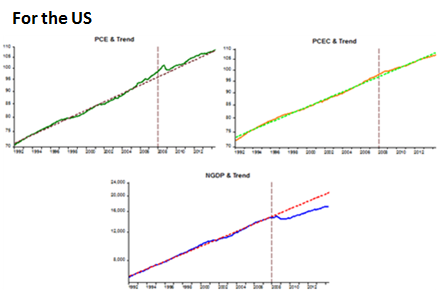 If trend real GDP growth is stable and policy is credible so that the expectation of inflation is aligned with the FOMC’s inflation target, as it was for most of the 1990s, these procedures translate into stable trend nominal GDP growth. Note, however, that this fact does not imply that the FOMC had a target for nominal GDP. 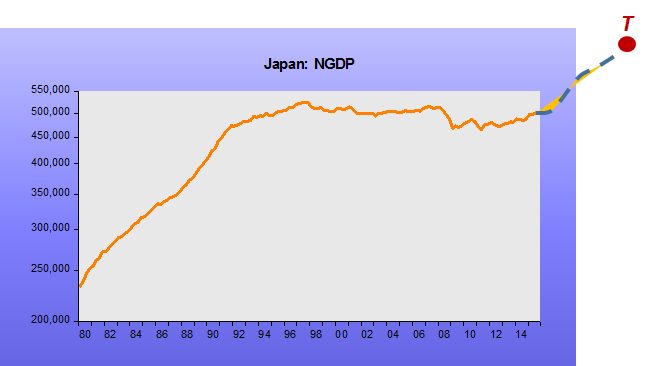 It would seem that a stable NGDP growth is the outcome, or result, not the driver! That´s the reason for him to suggest that NGDP may be a good benchmark (although not a target). My first observation is that trend real growth has been stable since the 19th century! It´s not a characteristic of the 1990s. The top chart shows RGDP and trend from 1870 to 2011 (yearly data). Trend growth is 3.4%. The bottom chart, based on quarterly data from 1954 to 2014, shows that trend growth is also 3.4% (up to 2007). 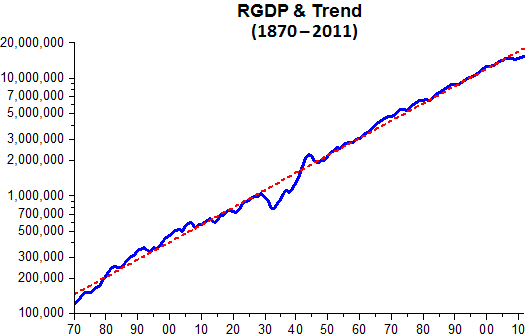 Note that following the Great Depression, RGDP reverted to trend. Will the post 2007 period become known in 50 years’ time as “the Bernanke Break”? My second observation is that during the 1990s, since the US did not have an explicit inflation target, policy credibility cannot be defined as the “alignment of inflation expectations with the FOMC´s inflation target”. 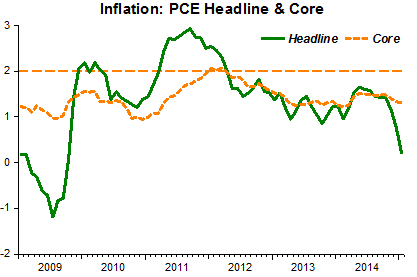 The FOMC´s “target” was “low” inflation, something vague. In the course of the 1990s, the Fed gained credibility because inflation remained “low”. 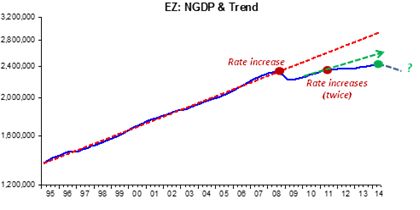 My conjecture is that that´s the outcome of NGDP growth evolving stably along a level trend path. The panel below indicates my conjecture has some validity. From the early 90s to early 2008, you could say the Fed “targeted” inflation, not at 2% but in a band of 1% – 2%. You could also say it targeted the price level (PLT) close to a 2% trend growth, but you could also say the Fed targeted NGDP along a 5.5% trend level path. The “Bernanke Break” serves to show that what “held everything together” was keeping NGDP evolving stably along a level path. 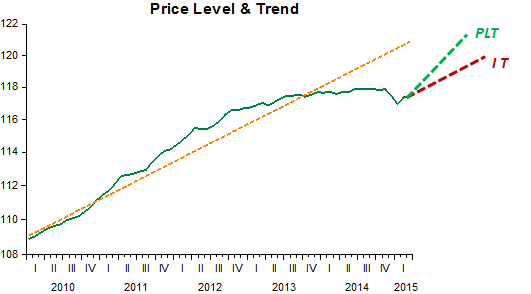 In 2008 it wasn´t inflation or the price level that indicated something was wrong. The “dog that barked” was NGDP dropping significantly and “permanently” below the trend path! At a hearing in February, Representative Scott Garrett, a New Jersey Republican, complained that Congress and the Federal Reservehad traded places. During previous periods of high unemployment, members of Congress pressed the Fed to print more money even as the Fed remained wary of the inflationary consequences of such efforts. After the Great Recession, by contrast, the loudest criticism has come from politicians demanding that the Fed shut down its printing press and raise interest rates. Raise the banner! Oops, I mean the Inflation Target! Has the 2% solution for inflation targeting in advanced economies made central bankers similarly delusional? Are they stubbornly attached to an outdated target? That argument gained ground in recent years as policymakers in Europe, Japan, and the United States struggled to stimulate weak economies and stabilize prices with policy interest rates stuck at the zero bound. Our view is that if policymakers could start from scratch, they might well choose a somewhat higher inflation target. Their rationale would be to avoid having to lower the policy rate to zero again in a future recession. But the cost of changing the policy framework now would be a substantial loss of credibility, so there seems little chance for a new regime with a higher inflation target. On this central point [the credibility issue], I don’t think we can know. This is the sort of thing central bankers and ex-central bankers [Steve being one!] say a lot. But there isn’t any good theory or empirics of reputation formation and dissolution, so we are in the dark. I remember thinking it rather wishful thinking that inflation targeting – simply promising to create the amount of inflation you wanted – would be believed, especially after a few decades of failed proper [read ‘intermediate’, ie exchange rate/monetary] targeting. I would also like to re-emphasize a point I made in my earlier post, that worrying about credibility is the right thing to do, but might cause us to be concerned about the status quo. If unconventional monetary policies are not as effective, or more costly to wield than interest rate policy, and if there are insurmountable political obstacles to using discretionary fiscal policy, then too-low inflation means more busts than we thought. And a higher risk of being trapped forever at the zero bound. I think the “higher IT” debate is a complete waste of time and effort. Over many years, even decades in some cases, inflation was kept low and stable, both for countries formally targeting inflation, either point targeting at 2% or targeting within a narrow band centered at 2%, and for countries, like the US, who had no numerical target, just a concept of what “price stability” meant (according to Greenspan, it was a rate of inflation that didn´t affect people´s plans). My conjecture is the “good times”, or “Great Moderation” experienced by many countries, many times beginning in the mid-1980s and extending to 2006-07, has mistakenly been credited to IT, even if it was, like in the US, only informal (or implicit). What was really behind the “good times” was the accomplishment, by many central banks, of nominal stability, a much more encompassing concept. In fact, the IT idea emerged, “out of the blue”, in the late 1980s, when the New Zealand government was seeking to improve general government performance and began giving departments and agencies clear goals by which they could be appraised. I can just imagine what went on in the head of the RBNZ Governor when asked how he should be evaluated. Seeing that inflation was falling after being in the two-digit range for many years, his quick answer must have been something like “keep inflation low”. Thus was born IT! That doesn´t give IT a good “pedigree”. Nevertheless, academics were quick to develop theoretical and model-based frameworks that gave IT the “pedigree” it needed to flourish. So why is it that at present there´s so much discussion on “regime change”? Earlier I spoke of ‘price stability’ as being one of the components of ‘internal balance’. Yet in the outline which I have just given of a possible distribution of responsibilities no one is directly responsible for price stability. To make price stability itself the objective of demand management would be very dangerous. If there were an upward pressure on prices because the prices of imports had risen or because indirect taxes had been raised, the maintenance of price stability would require an offsetting absolute reduction in domestic money wage costs; and who knows what levels of depression and unemployment it might be necessary consciously to engineer in order to achieve such a result? This particular danger might be avoided by choice of a price index for stabilisation which excluded both indirect taxes and the price of imports; but even so, the stabilisation of such a price index would be very dangerous. If any remodelled wage-fixing arrangements were not working perfectly, – and it would be foolhardy to assume a perfect performance – a very moderate excessive upward pressure on money wage rates and so on costs might cause a very great reduction in output and employment if there were no rise in selling prices so that the whole of the impact of the increased money costs was taken on profit margins. If, however, it was total money incomes which were stabilized, a much more moderate decline in employment combined with a moderate rise in prices would serve to maintain the uninflated total of money incomes. Flash forward thirty years to 2007 and the “danger” materializes under Bernanke Chairmanship of the Fed. And this mostly happens because Bernanke was known as an ardent defender of inflation targeting and would likely act accordingly. I have told this particular story simply to make the point that the choice between fiscal action and monetary action must often depend upon basic policy issues which should certainly be the responsibility of the government rather than of any independent monetary authority. Perhaps the best compromise is an independent monetary authority charged so to manage the money supply and the market rate of interest as to maintain the growth of total money income on its 5-per-cent-per-annum target path, after taking into account whatever fiscal policies the government may adopt. One would hope, of course, that there would be a suitable discussion of their plans and policies between the government and the monetary authority; but the latter would be given an ultimately independent duty and independent choice of monetary policy for keeping total money incomes on their target path. Among the suggested “new regimes”, NGDP Level Targeting stands out. Why so much interest in NGDP Level Targeting? To me, one important, maybe even defining, reason is that over the whole of the pre 2008-09 crisis “inflation targeting period”, including all the non-IT central banks, like the Federal Reserve, that nevertheless managed to keep inflation low and stable, all the “targets” (NGDP-LT, IT and PLT) were observationally equivalent. 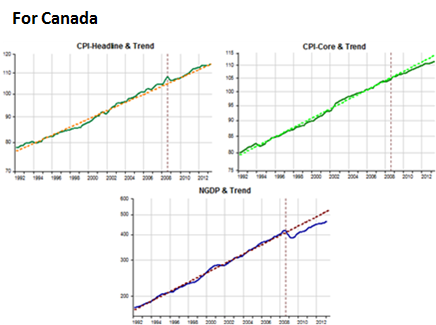 To illustrate I look at Canada, an inflation targeter and the US, which did not target anything explicitly. For both countries before the crisis, NGDP growth trend is 5.4% while both Headline and Core inflation are approximately 2% in the two countries. Note that up to the moment the crisis hit, you wouldn´t be wrong to think, if you didn’t know otherwise, that both countries could be doing either IT, PLT or NGDP-LT. There´s no way to distinguish among the alternatives. In fact, inflation targeting is not something that naturally defines central bank procedures. If you contrast New Zealand and Australia, for example, you´ll learn that macroeconomic outcomes other than inflation can be widely different even for inflation targeting central banks. This adds to Ball and Sheridan´s findings in their 2003 article “Does Inflation Targeting Matter?” that since the early 1990s inflation has been lower and more stable in both IT and non-IT countries. 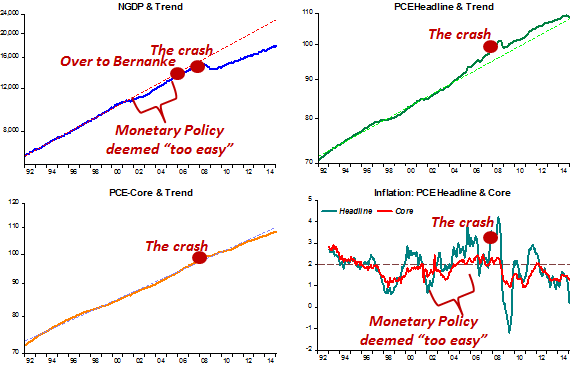 Ball and Sheridan´s findings are consistent with the idea of observational equivalence between IT, PLT and NGDP-LT that I illustrated using Canada and the U.S. From this, one could infer that low and stable inflation countries followed a de facto NGDP-LT targeting. The crisis had the effect of revealing the actual targeting regime. A country such as Australia, where NGDP remained close to trend is more likely to have been following a NGDP-LT targeting regime than Canada or the U.S., where NGDP dropped well below trend. 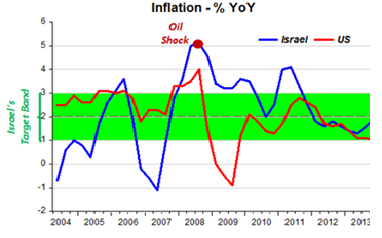 Another inflation targeting country that the crisis revealed was de facto targeting NGDP is Israel. The contrast between Israel and the U.S. clearly brings out the danger of IT alluded to by James Meade. Although the U.S. was not formally an IT country, when Bernanke took the helm at the Fed in early 2006, it got much closer to being an IT country. The different reaction of each Central Bank to the oil shock explains the different outcomes. While an oil shock (a negative supply shock) increases inflation and reduces growth, those effects tend to be temporary and the best monetary policy can do is to keep nominal spending close to trend. The charts show that by doing exactly that Israel avoided the real output contraction that befell the US and other de facto IT countries. The German-centric ECB is arguably the most ardent IT central bank. For market monetarists, who strongly favor NGDP-LT, it is not surprising to observe the dramatic results, with the region going into deflation and real growth being close to zero and negative for some individual countries. The chart below removes any doubt one may have on the dangers of inflation targeting in the face of supply shocks. In the chart we observe the dramatic consequences of the ECB tightening in reaction to the rise in oil prices in 2008 and again in 2011. They certainly are not irrelevant. Countries, be them inflation targeters or not, that were on a de facto NGDP-LT regime fared much better than the de facto inflation targeters. And the reason is straightforward. NGDP-LT provides a much higher degree of nominal stability to the economy, and thus is much more effective in limiting the propagation of real shocks. Therefore, instead of “suggesting” a higher target inflation, economists should try to help central banks “rediscover” nominal stability. For that, finding the appropriate level of nominal spending is required. It is not enough to just keep nominal spending growing at a stable rate, as the US has mostly done since emerging from the crisis.